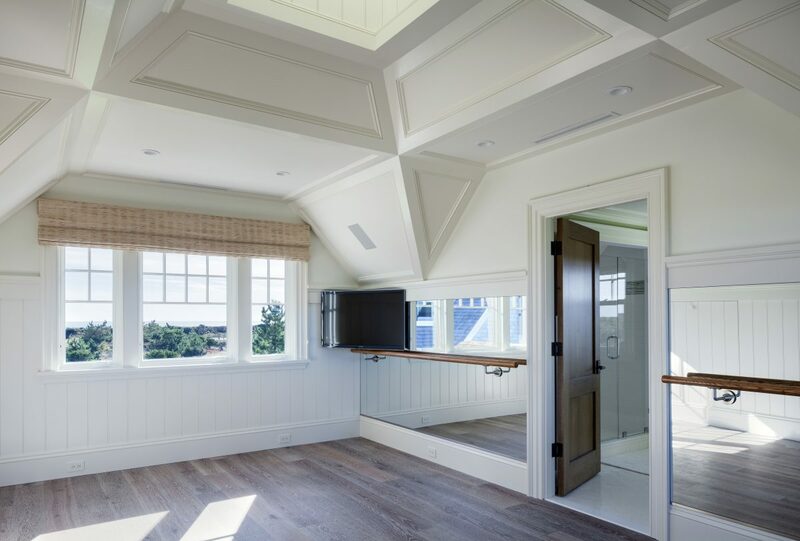 Molière once said, “The greater the obstacle, the more glory in overcoming it.” That was certainly the case for renowned architect Patrick Ahearn when he designed the Atlantic Drive Double Gable property in Edgartown, Martha’s Vineyard. 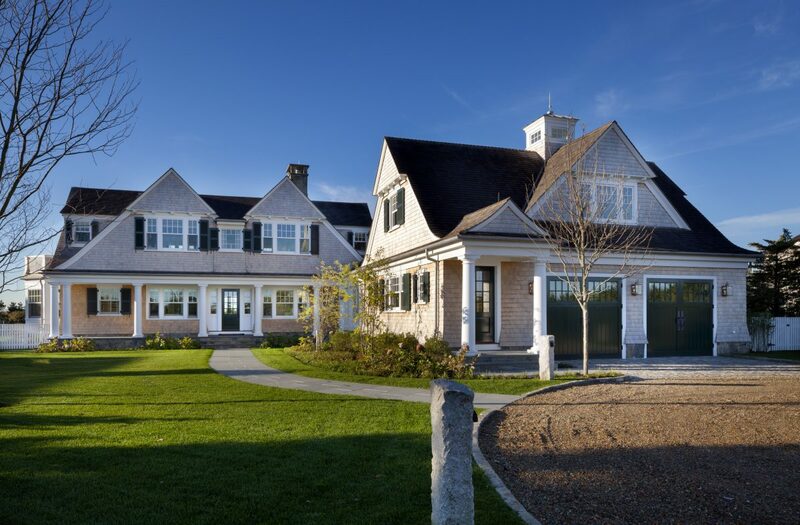 Ahearn has designed and revitalized more than 140 properties in Edgartown, including all of the homes on Atlantic Drive. This one presented more than the usual challenges. First of all, the new construction needed to showcase “implied history,” as if it had existed for nearly 100 years. Building regulations limited its height to 30 feet, which was difficult because of the uncooperative topography of the nearby dunes. Additionally, there was the necessity to safeguard against the inevitable New England storms by elevating the home and mechanical equipment above the flood plain, and installing hurricane-rated doors and windows. However, the major challenge Ahearn and his crew faced was in constructing an “upside-down” home that all felt “right side-up.” This goes back to the 30-foot height restriction which meant the gathering spaces and guest quarters needed to be on the second floor to take advantage of the property’s panoramic ocean vistas. The idea was to create a shingle-style island vernacular architecture that would not bring attention to its upside-down nature. Mission accomplished. The result was this seaside architectural masterpiece that is grounded with the land surrounding it, yet one that permits its residents to seamlessly move between the upper decks to the pool level without the stair systems being immediately visible (i.e., the upside-down challenge). He constructed a family compound consisting of a new primary home with a detached three-car garage, a guesthouse with an attached carriage house, a cabana with outdoor showers, a pergola-covered outdoor fireplace and grilling area, a pool and a hot tub. The grounds also hold a bocce court and gardens. The main house was designed to look as if it had been built in the 1920s or 1930s (the implied history aspect) and then added onto over time. It creates a legacy of New England’s rich nautical past while adapting to the comforts and amenities that people expect today. Ahearn combined and blended two lots, creating symmetry among the structures. The guesthouse, which has a second-floor ballet studio, was designed as a junior version of the main house. It and the carriage houses maintain the double-gable roofs found on the primary house, as well as the upside-down nature. Ahearn has a knack for extending the living space of his homes. At Atlantic Drive Double Gable, it continues beyond the walls to an extensive outdoor living room that includes a freestanding kitchen with a two-way open gas fireplace, a gathering area and a bocce court — all underneath a semi-enclosed pergola. 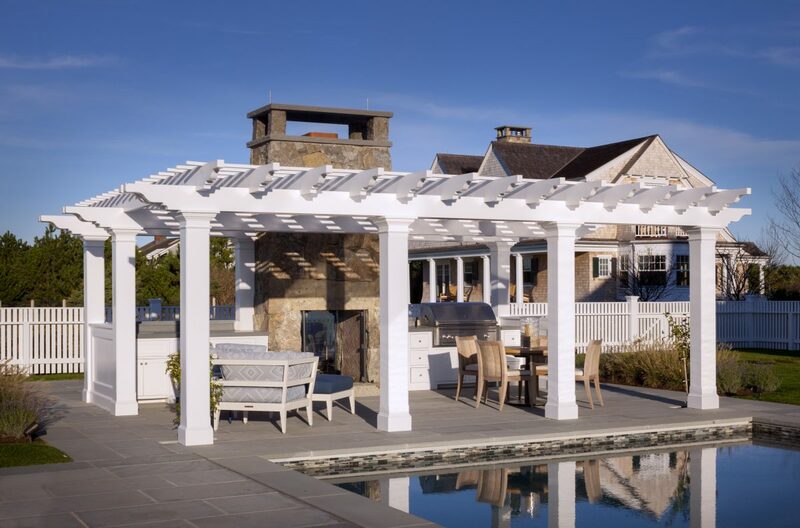 It is positioned at one end of the 90-foot pool and hot tub, which is bookended by its own pergola and adorned with carefully selected furniture to enhance its resort-like ambiance. 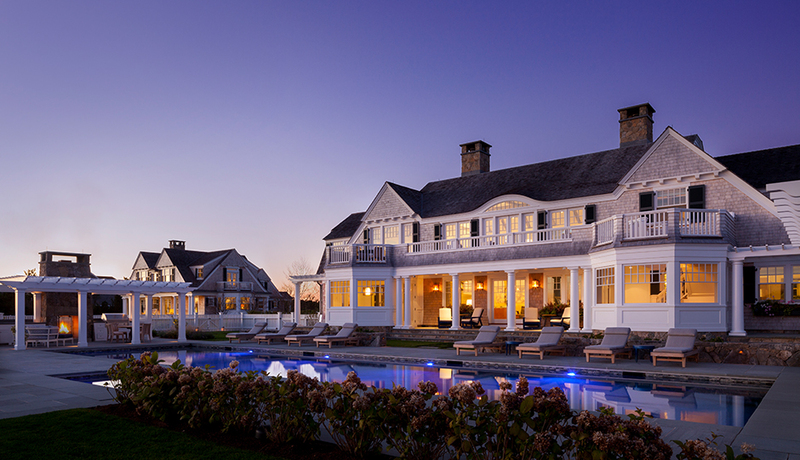 At night, multicolor pool lighting and soft façade lighting work with the lit fireplaces and porches to give the area a magical glow that reflects — and embraces — its ocean locale. Ahearn’s design has inspired an inviting mélange that is ideal for entertaining any time of day or night. As one would expect from Patrick Ahearn, the interior is as spectacular and bespoke as the exterior. 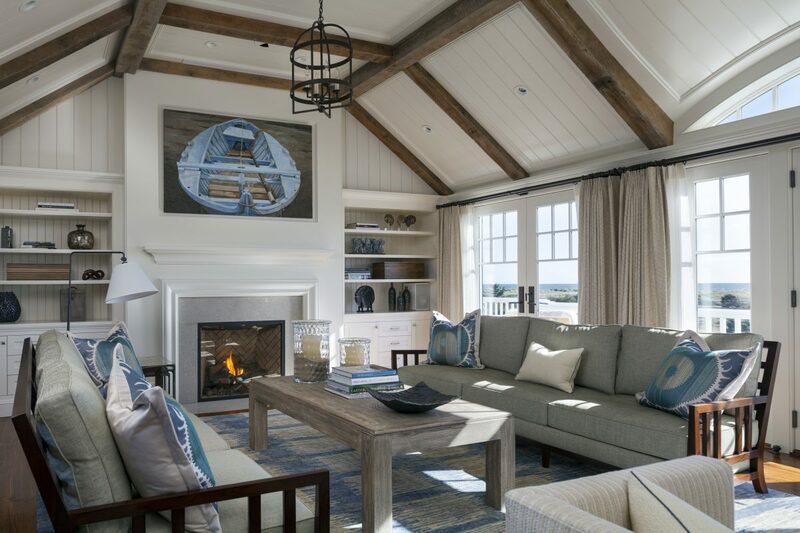 Exposed beams over a beadboard ceiling in the living room add character to a nautical palette of vivid blues balanced by serene white. 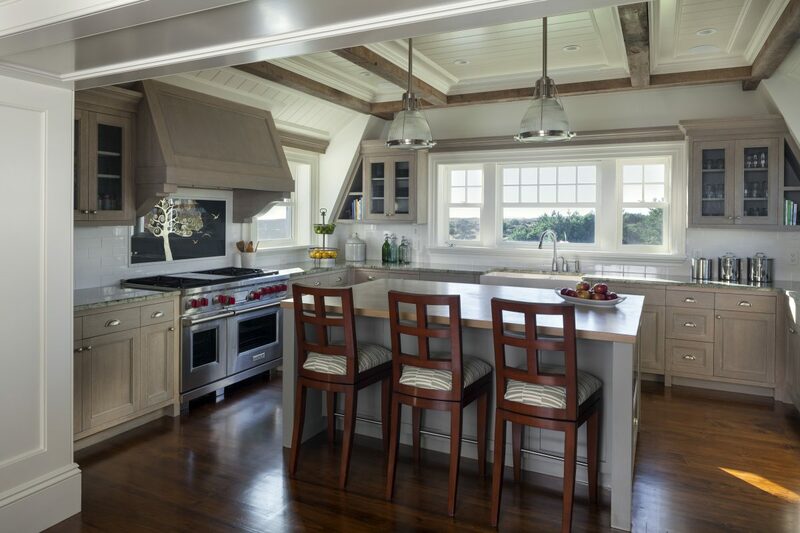 Everything inside works to enhance the views, including adjustable pulleys that keep the dining room lights up and away during the day, so as not to obstruct the ocean vistas. In the rest of the house, hues of grays, greens and blues mimic the water’s color. Even the kitchen suits the seaside motif with green tones and driftwood textures. The cabinets and range hood are wire brushed. A one-of-a-kind backsplash (a mural by island artist Kara Taylor) is the focal point of the room. Throughout the house, the design team played with texture and pattern in muted tones, adding bursts of color here and there. 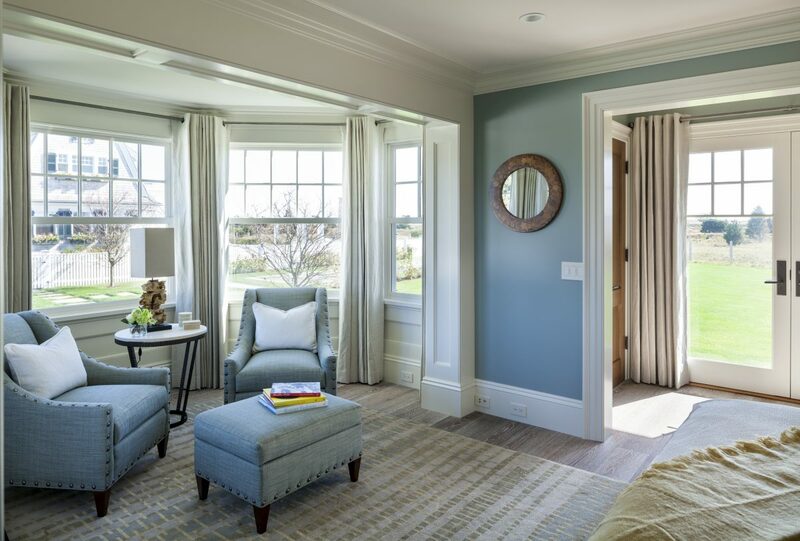 Along with careful placement of furniture and accent pieces, there is a comfortable flow from room to room and level to level, as well as an overall complementary relationship between the structures and their stunning seaside surroundings. 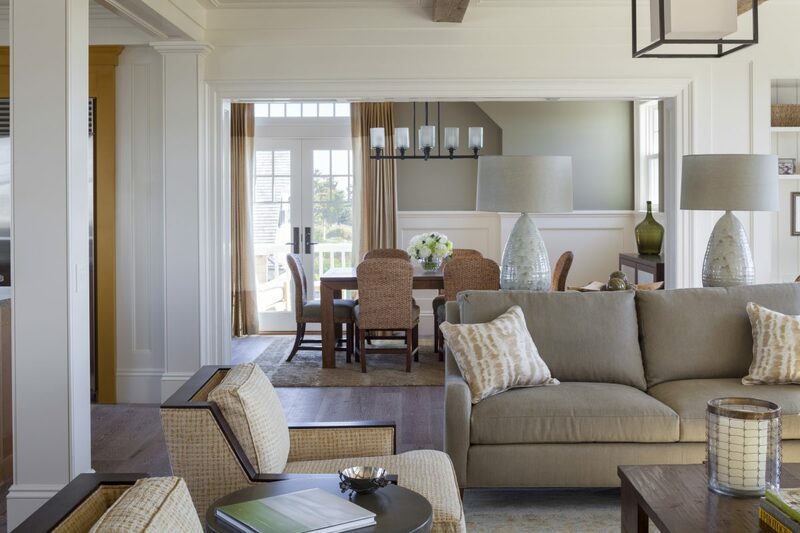 Patrick Ahearn has once again given a new home the look of timeless New England seaside tradition. The rear view of the compound shows how each building and the outdoor living spaces complement each other. 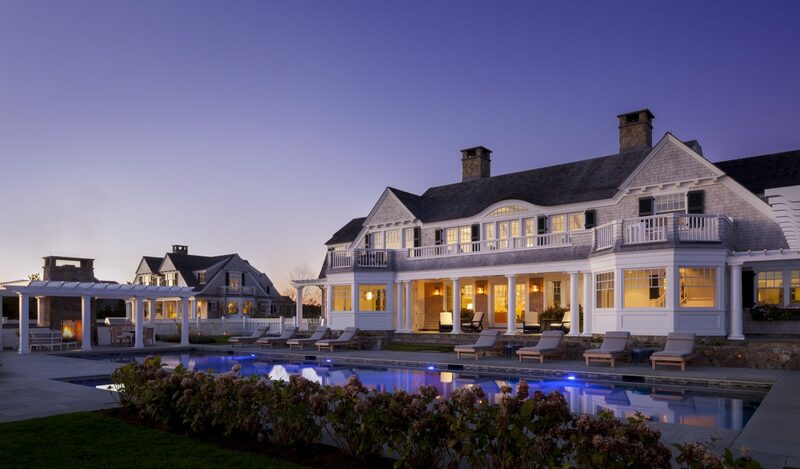 At night, multicolor pool lighting and soft façade lighting work with the lit fireplaces and porches to give the area a magical glow that reflects — and embraces — its ocean locale. The guest house with attached carriage house is a junior version of the main house. 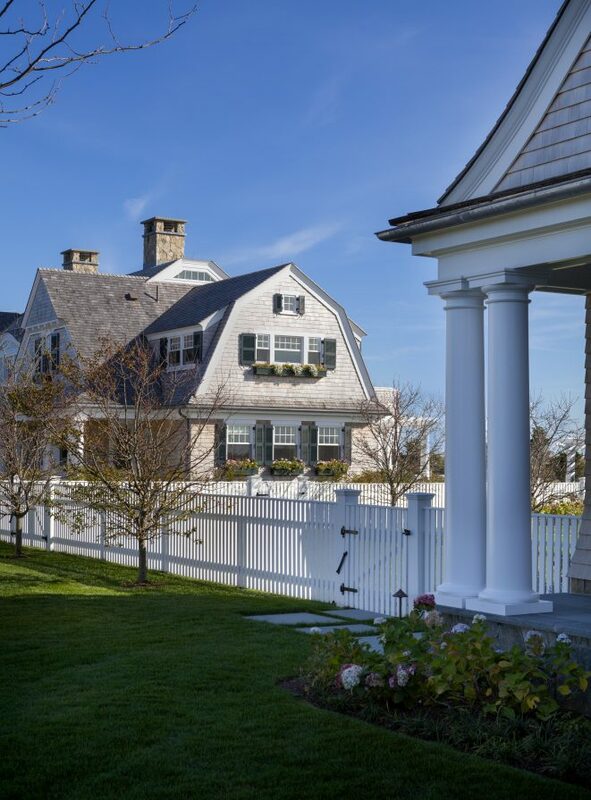 The view from the guesthouse to the main house shows the easy access between the two, while the gambrel roof structure compensates for the 30-foot height restriction with additional usable space. The Olympic-sized pool is bookended by two pergola-covered living spaces offering an opportunity to retreat from the hot summer sun and still enjoy the fresh air and ocean breeze. The resort-like vibe of the outdoor living area features a fireplace that is also operational from the outdoor kitchen. 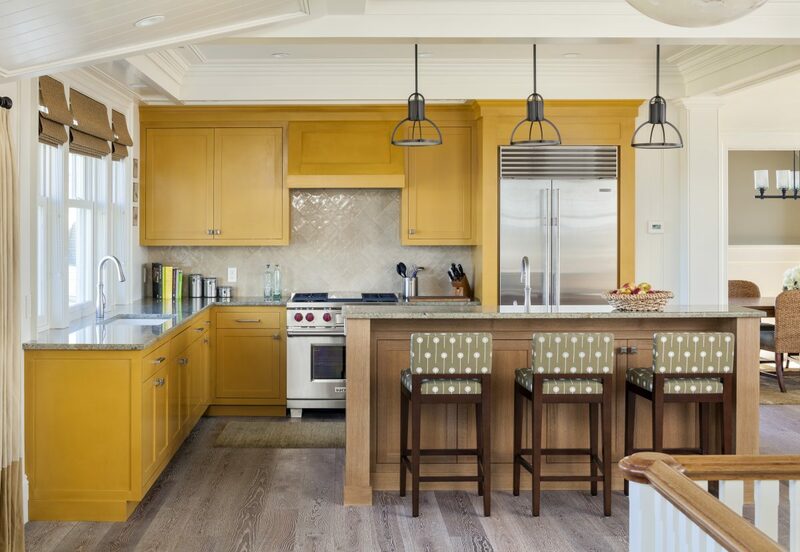 The open kitchen features wire-brushed driftwood-colored cabinets, a custom mural backsplash and deep mahogany chairs that match the kitchenette’s cabinetry. Lights above the dining room table operate with pulleys and can be lifted during the day for unobstructed ocean views. Those views are enhanced via the second-floor balcony that opens to the outdoors from the primary living spaces. Exposed beams and the arched beadboard ceiling resemble the hull of a ship, while the ship photo over the fireplace solidifies the great room’s color palette. 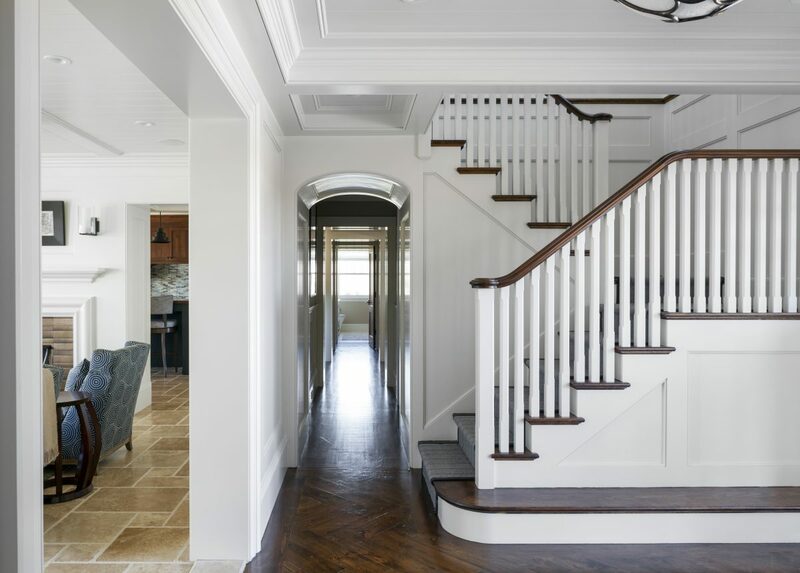 The herringbone wood floors and full-height millwork paneling is carried from the entry hall, up the stairs, suggesting that the formal living spaces are located on the second floor. Beyond the entry hall, the flooring transitions to stone-cobbled travertine, a move from formal to casual living. 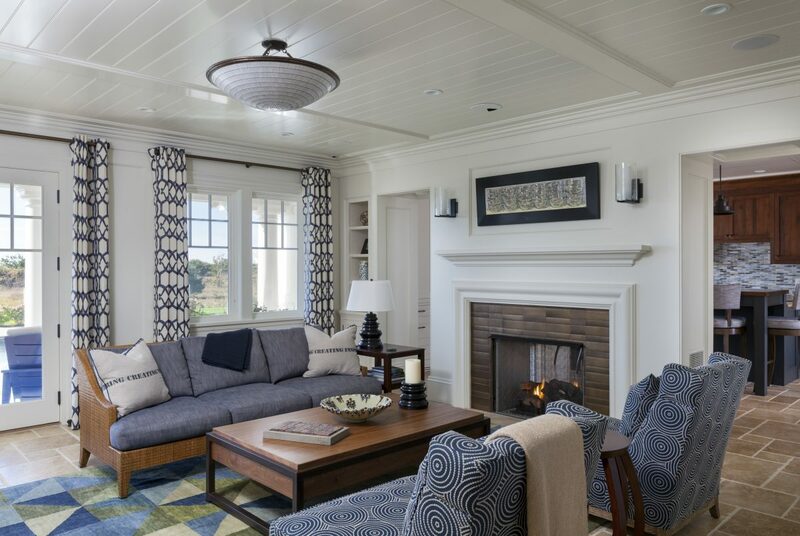 The family room boasts pops of nautical color and an inviting fireplace. The pattern of the rug is reminiscent of sails. From the stone flooring underneath to the lightly cased ceiling, this welcoming space reflects a casual island lifestyle. 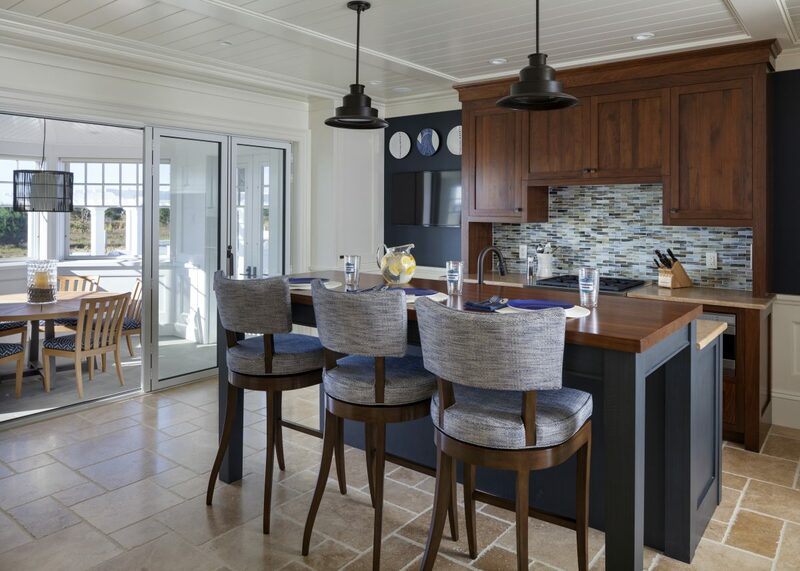 The kitchenette and bar off the screened porch have a casual seaside feel with a glass-tile backsplash in blues and greens, and deep wood cabinetry. The small solarium off the kitchenette provides room for a breakfast nook, extending the limits of the interior. 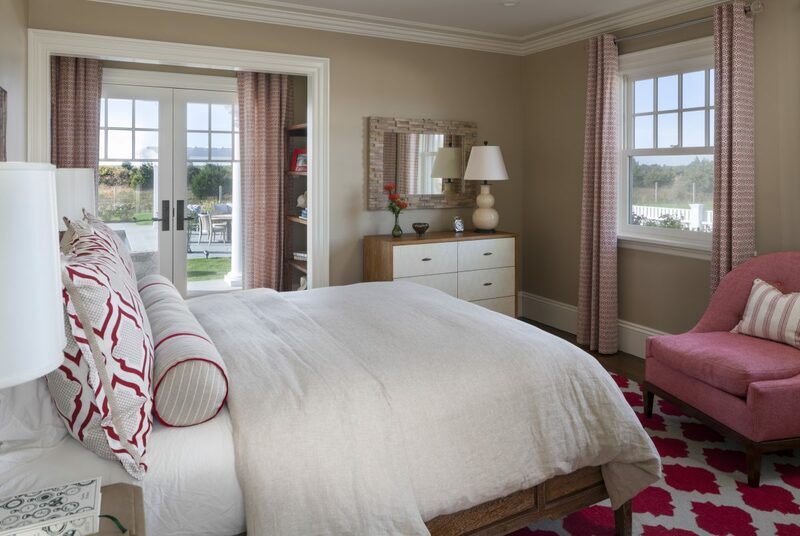 Unexpected reds make a statement in the guest bedroom, which also has remarkable views. 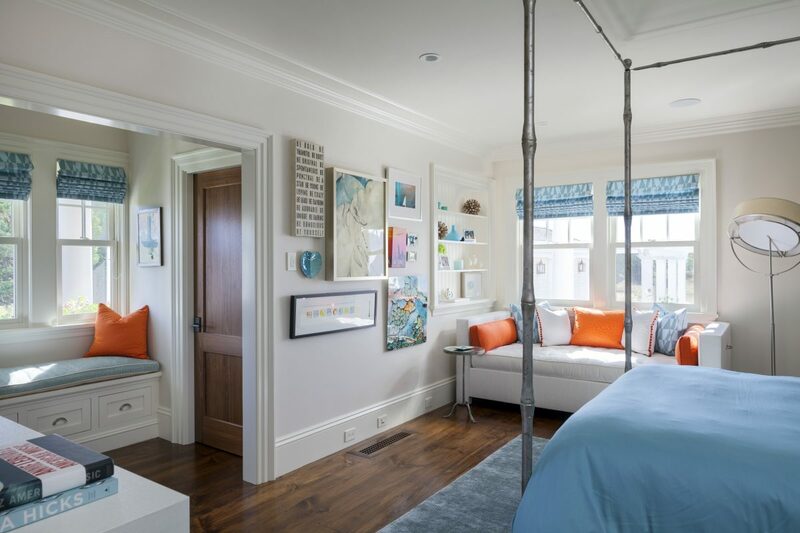 Everything about the bedroom is happy, from the pops of blue and orange to the multiple window seats. 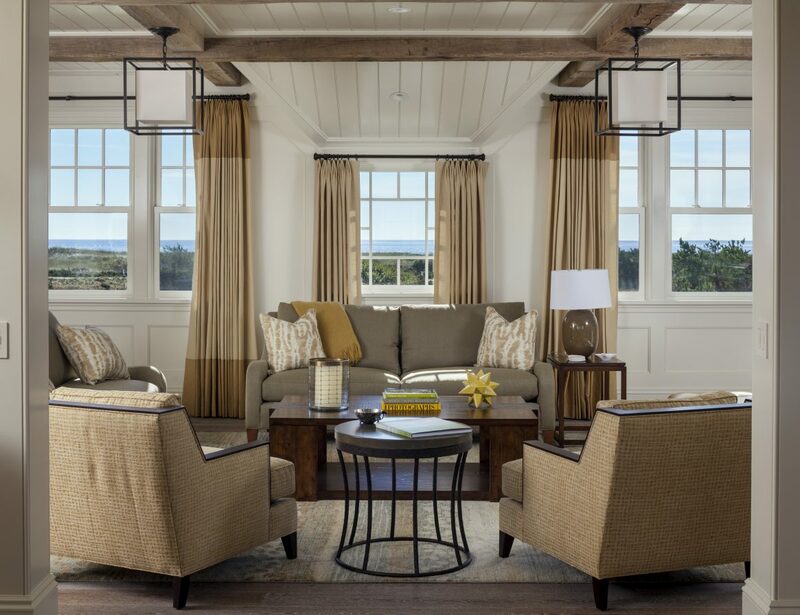 The great room’s beadboard and exposed beams lead one’s view toward the amazing ocean vistas. The sunflower yellow kitchen and mellow green chairs provide yet another tie to the outdoors. 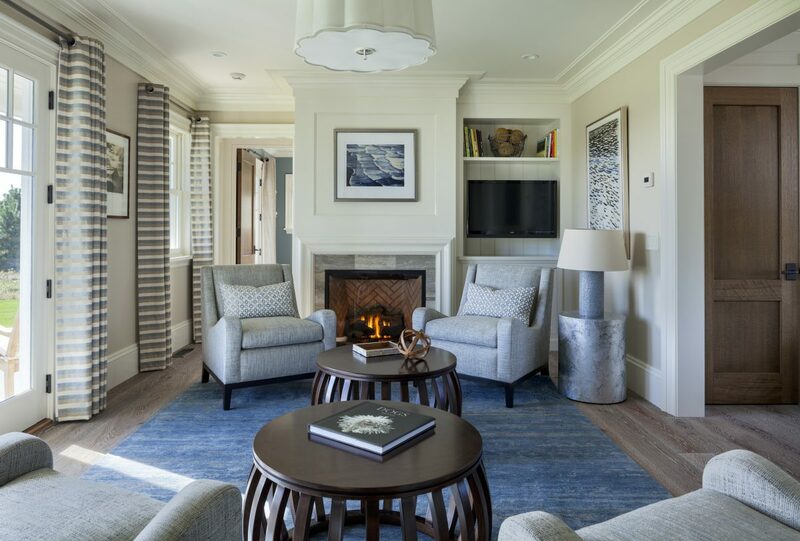 A rippled blue rug, resembling the ocean waves, joins two seating groups in the guesthouse family room. The bedroom’s seating area is centered in a bay window overlooking the main home and the bocce court. The pale blues and driftwood-colored flooring offer a connection to the outdoors. The ballet studio lets light dance in effortlessly, and its coffered ceiling adds grace and romance.